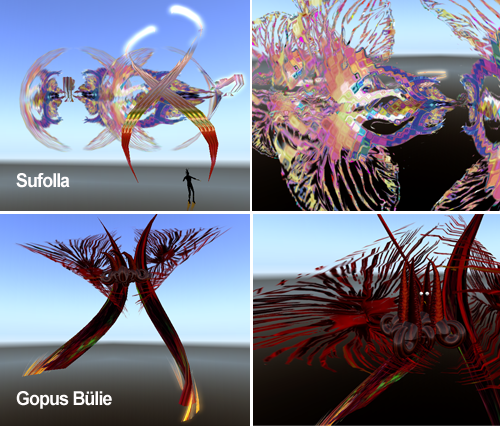 SkyDance V – “Innocence End” by DC Spensley, also known as DanCoyote Antonelli in Second Life. 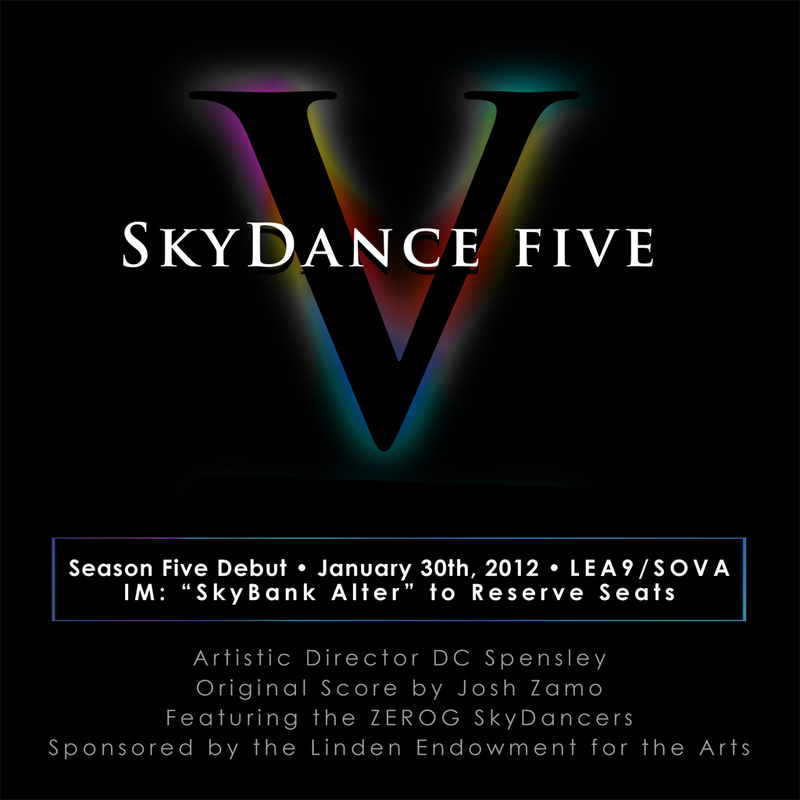 This is the fifth full redesign of the SkyDance show since the troupe’s founding in May of 2006, and features the original musical score by Josh Zamo, all new choreography performed by the SkyDancers (Anhinga Chaika, Tatiana Kurri, Angelique Menoptra, Buffy Beale, Pielady Smalls, Talulah Bancroft, Wytchwhisper Sadofsky, Juji Kumsung, Neena Botanical and Dot Pellazi), all new cascade costumes by DC Spensley, and a three-kilometer (3000m) stage set by DanCoyote in collaboration with some of the top creators in Second Life including Oberon Onmura and Selavy Oh. The ZeroG SkyDancers log into Second Life from all over North America to perform for audiences in real time. The SkyDance V program consists of dramatic in-flight choreography telling a story of an interstellar people whose bliss is to dance forever in the depths of space. The Sufolla have no guile and when they are set upon by the Gopus Bülie, “The Destroyer of Dreams” they are desperate to return the Gopus to its ancient cage where it can no longer torment them. The Sufolla sacrifice one of their own to anoint as the Hereau, one who can never again be like them but who has the strength to struggle with the Gopus Bülie. Will the Hereau defeat the Gopus and help the Sufolla? Its your decision in SkyDance V because audience participation determines the outcome of the storyline. Performances will be on Wednesday evenings at 7PM SLT. Please plan to arrive at least 15 minutes before showtime to be seated and learn how to configure your viewer and complimentary heads up display for optimum enjoyment. Seating is limited so please reserve your place by contacting SkyBank Alter in SL by IM or via email at skybank@dancoyote.com, noting the date you wish to attend and how many seats you would like to reserve. You will be invited to a temporary audience group to allow access to the stage sim for the show. The suggested ticket donation is $3 USD (1000 L$) per person, but sliding scale donations are appreciated. Thank you for supporting the ZeroG SkyDancers!